How to Clone Laptop Hard Drive to USB in Windows 7/8/10? If you want to move all data on your laptop to a USB drive, clone laptop hard drive to USB should be the most effective way. Here you can learn how to clone laptop hard drive in Windows 7/8/10. Want to clone laptop hard drive to USB? Sometimes, users would like to clone their laptop hard drive to an external hard drive to keep their system, applications, and other data safe. Thus, even if there are some bad things happen, such as laptop stolen, hard drive broken, system crash, etc, you won’t miss any data on your laptop. USB should be a good choice for destination media because of it’s portable and it is very convenient for people working on different places. Well, how to clone laptop hard drive to USB? AOMEI Backupper Professional is a remarkable software that can help you clone laptop hard drive to USB drive with its “Clone” feature, no matter what operating system you are using. Because AOMEI Backupper Professional supports Windows XP/Vista/7/8/10. Here will introduce you the specific steps of how to clone laptop hard drive to USB drive. Before you do, here you should prepare for it. 3> Install AOMEI Backupper on your laptop. Step1. Launch AOMEI Backupper. 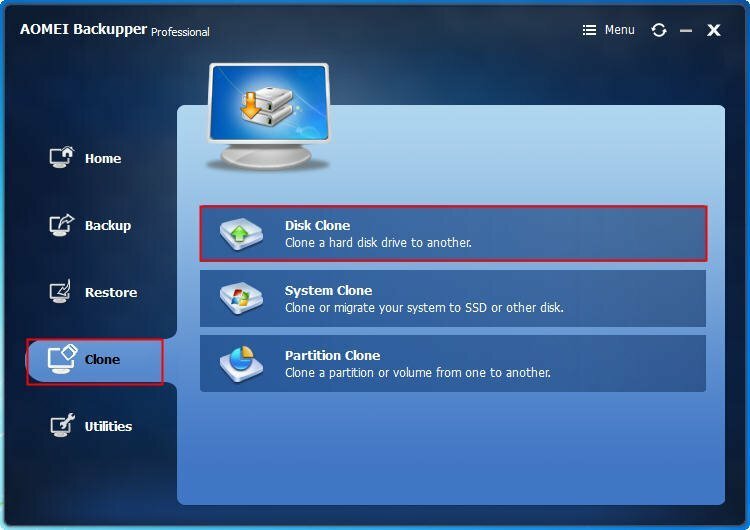 To clone laptop hard drive to USB drive, here you should select Disk Clone under theClone tab. Step2.Then, select the laptop hard drive as the source disk. Step3. Here, select the USB drive as the destination disk. Step4. After selecting the source party and destination party, here you can confirm the operations, and set up more for cloning laptop hard drive to USB in Windows 7/8/10. If there is no problem, click Start Cloneto submit all operations. ● The “Edit partitions on the destination disk” is for you to resize the partition on the destination disk. ● The “Sector by sector clone” will clone every byte on the source disk. Once you choose to clone sector by sector, you need to prepare a USB drive as large as the source disk at least. And it will take more time. ● The “Align partition to optimize for SSD” is for optimizing the performance of SSD, if you are cloning to the SSD, you can tick the box. Migrate data to USB is such a simple thing. AOMEI Backupper Professional is a fabulous software for Windows PC users backup, restore, clone data, it only needs few simple steps. With this software, you can clone larger drive to smaller hard drive, or copy hard drive to another hard drive, create bootable media, etc. It is worth to own for keep data safe.